Tonight Sam and I are celebrating by going out to dinner (don’t worry-the meal I made last night will be up tomorrow!) and sharing one of our favorite wines. 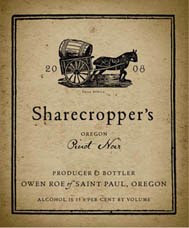 It’s a pinot noir from Oregon called Sharecropper’s and at under $25, it’s perfect for a little celebration. Try it sometime…if you can find it! Fall is here, but there’s still time to use those last few tomatoes that are in the farmers markets right now. 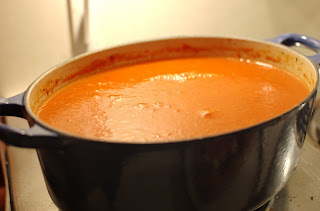 When I got back to work yesterday, my colleague was looking for the perfect easy tomato soup recipe – so it of course got me thinking of one of my favorites! I make this one a bit quicker by using whole peeled tomatoes, and less creamy by just using ¾ of a cup of milk instead of cream. 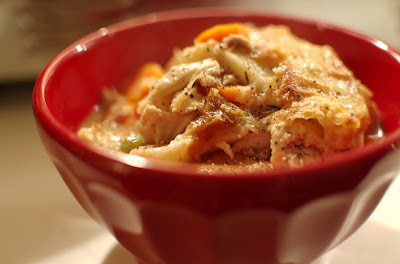 Paired with a grown up version of “grilled cheese”, this made a perfect Monday night meal! Heat oil in a large stock pot (mine is 2 ¾ qt. and this just fit!). Add the onions and carrots and sauté for about 7 minutes, or until very tender. Add the garlic and cook for 1 minute. Add the tomatoes, sugar, tomato paste, basil, chicken stock, salt, and pepper and stir well. Bring to a boil, then lower heat, and simmer, uncovered for 20 minutes. The tomatoes should be very tender. 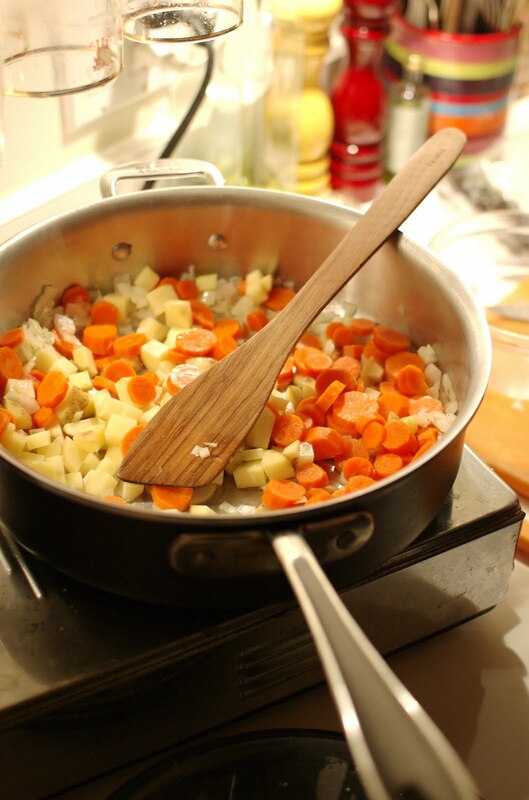 Add the cream to the soup, and using a hand blender (or a food mill or regular blender), blend until smooth. Reheat the soup and taste, adding salt & pepper as needed. 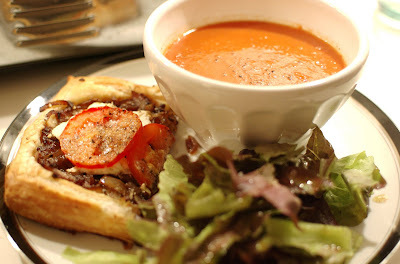 When the soup is simmering, start making the tomato and goat cheese tarts. Heat oil in a small skillet over medium to low heat and add the onions and garlic. Sauté for 10 minutes, stirring frequently, until the onions are limp and there is almost no moisture remaining in the pan. Add salt & pepper and the wine and sontinue to cook for another 5 minutes, or until all of the liquid is absorbed and the onions are browned. Remove from heat. 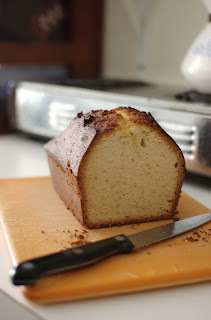 Using a sharp paring knife, score a ¼ inch wide border around the pastry. Prick the pastry inside the score lines with a fork. Place the onion mixture within the scored edge and crumble the goat cheese over the onions. 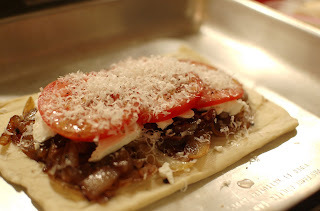 Place the slices of tomato on the tart and sprinkle with salt & pepper and the grated parmesan. Bake for 20-25 minutes until the pastry is golden brown. After spending a really wonderful weekend with the girls, I have tons of ideas for the next few weeks of posts – most of which are great ideas for using leftovers of all kinds! It seems like as soon as we got out of the city, it felt like fall. The weekend was chilly and damp, all together perfect. We stopped for lunch in a cute town (literally every other store sold antiques) and had a quick bite to warm us up before heading out to a vineyard. One of my friends got a potpie that was only ok, but it inspired me to make a better version of one. The best part? 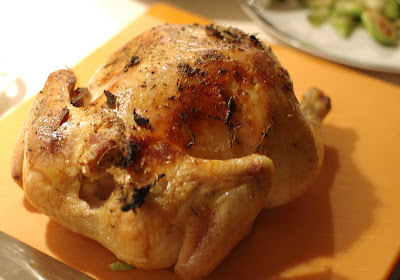 I already had leftover chicken from the roast chicken I made last week! This recipe is fairly quick and with the addition of white wine and thyme, it reminds me of a dish called Bouche a la Reine. 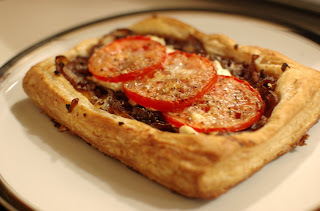 I made this one with a store bought puff pastry that I would absolutely cover with foil the next time I make it – just 30 minutes in my littler toaster over left it a little burnt on top and not fully cooked through. The filling though, was perfect! In a small pot, bring the chicken stock to a boil and allow it to reduce by half. While this is reducing, in a sauté pan, heat up 2 tbsp. butter. Add onions and sauté for a minute. Add the carrots and sauté for 2 more minutes. Add the potatoes and sauté until vegetables are tender. Stir in the flour and stir continuously until it is all combined. Add dashes of salt & pepper. Add the reserved 2 c. chicken stock and milk. Bring to a boil and allow it to thicken. Add the thyme, more salt & pepper, and wine, then add the chicken. Stir and allow peas to defrost a little. Taste the broth and add more seasoning to taste. Pour filling in to a 2 qt. baking dish or into individual ramekins. Top with puff pastry or pie crust – be sure to leave an inch and a half overhang on the pastry, it will shrink up. 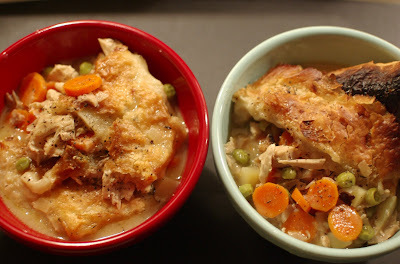 Bake the potpie for 30 minutes, or until bubbling and the pastry is golden. I woke up this morning to a really really pleasant surprise! 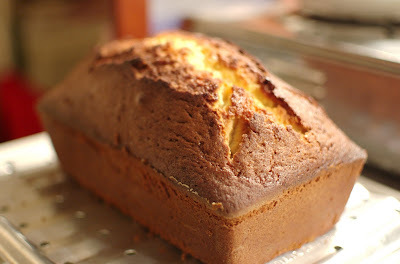 A highlight on Food52.com! If you haven't heard of this new recipe collective website, get to know it. It's a fabulous idea from ex-NYTimes food reporter, (and author of Cooking for Mr. Latte!) Amanda Hesser, and her friend and fellow food journalist, Merrill Stubbs (who notably worked at the wonderful Flour Bakery in Boston!) Their idea? To create a cookbook filled with the best recipes from homecooks everywhere – posted by you, the homecooks, and then tested and voted upon. Every week they hold these recipe contests and after one year, the winners will be published in a beautiful, glossy, cookbook! So get cooking! When I saw them sitting there I just couldn’t resist. I didn’t care what else I made, the sprouts would be the centerpiece of the plate. But then I got ambitious, as usual. I bought what should have been a wonderful piece of beef from market (it wasn’t, although the marinade was good) and then picked up some fennel for a great salad, and fresh bread to top off the meal. The fennel salad is a wonderful addition to my rotation (thank you Melissa!) 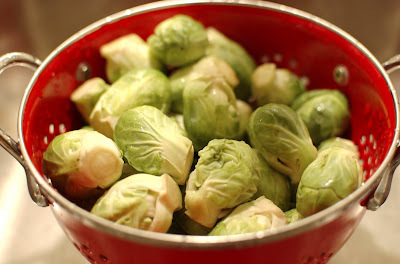 and I did almost nothing to the brussels sprouts – this meal just highlights the food in it’s most basic form. Pour the olive oil on the meat and coat on both sides. Generously salt and pepper both sides of the meat. Add the garlic and the wine and let sit for at least 2 hours. I usually like to make these with chicken stock, but I didn’t have any on hand so I improvised. Heat oil in a pan. 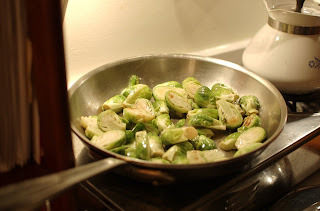 Add brussels sprouts and salt & pepper and sauté, stirring occasionally. Cook until they are just browned, about 3 minutes. Pour in water and cover the pan. Cook for about 3 minutes until just tender. Uncover and cook for another two until the water is evaporated. Taste them when then get tender - they should still be crisp, not soggy and falling apart. 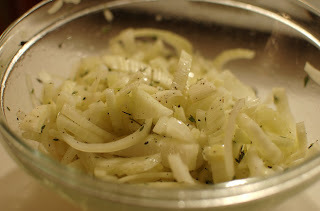 Place the fennel and onion in a bowl. Toss with the olive oil, lemon juice, salt & pepper. Add the thyme. Adjust ingredients as needed. You may need more lemon juice to give it additional acidity, according to your taste. Once plated, grate the parmesan directly onto the salad – this gives it a wonderful nutty flavor that cuts the onion nicely. I’m still getting into the swing of things here (yes, I realize it’s Thursday). Going back to work after over a week of vacation is hard! Plus Sam has decided to row in the Head of the Charles in October, so we’re kicking it into overdrive here at Hotplate Confidential. If you ever wonder how we cook dinner after work so often, it’s really because we never eat dinner before 9pm. There’s just not enough time in the day! 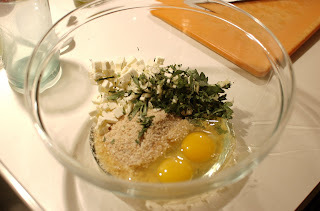 In a large bowl, combine the breadcrumbs, parsley, tomato paste, garlic, eggs, milk, feta, salt & pepper. Add the turkey and gently stir to combine – don’t overwork the meat. Pack the mixture into a loaf pan (mine is 8.5 x 4.5 x 2.5 and it was at half full) and bake in the (toaster) oven for 45 minutes or until the internal temperature registers 165°F. Heat oil in a sauté pan. When hot, add the onions and stir for 5 minutes. Add the garlic and stir until the onions are translucent and tender. 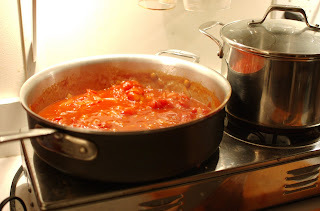 Add the whole peeled tomatoes and cut them in half in the pan. Add the sauce, tomato paste, sugar, and salt & pepper and let simmer for at least 30 minutes. Stir occasionally. This sauce is best when given a little time, but in a pinch, can be ready in 45 minutes. Boil the potatoes with the cloves of garlic. Once tender (about 20 minutes) drain the potatoes and garlic and put back in the same pot. 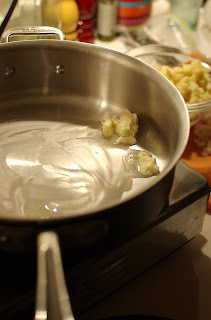 Add butter, milk, salt & pepper and “mash” using an immersion blender until smooth. Now I just love my immersion blender so I tried it out on this for the first time tonight. It worked wonders! 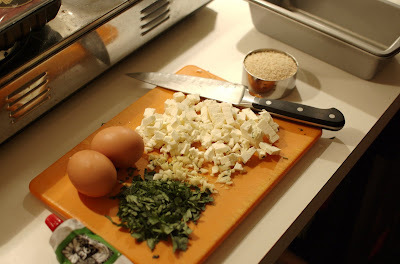 But, you can also use a ricer, just rice the potatoes and garlic before adding the other ingredients. I promise posts to come will be more exciting! I’m planning on going to the farmer’s market on Saturday and can’t wait to see what’s new! Oh, and maybe I’ll be able to cook without losing electricity this time…. After eating our way through Portland (and Boston this weekend), Sam and I needed a break – and something with a lot of vegetables. 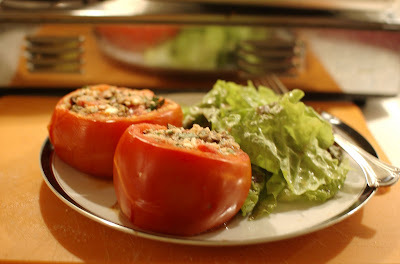 These stuffed tomatoes can be made with a variety of ingredients. I’ve tried them with ground lamb (delicious!) and beef, but tonight I went with mushrooms and feta cheese. I also bought a zucchini, which I of course forgot to use and is still sitting in the fridge, but I think it would be a nice addition. You can make the filling in advance and then just hollow out the tomatoes when you get home for a tasty and simple weeknight meal. I like them with just a simple salad but with smaller tomatoes, they could also be a great side dish. 4 large tomatoes, with the flesh scooped out and reserved. Preheat the (toaster) oven to 375º F.
Cut off the very top of the tomatoes, saving the tops, and use a large spoon to hollow out the flesh of the tomato. Reserve this in a medium sized bowl. Once you’ve hallowed out all 4, strain the pulp out once to get rid of most of the juices. 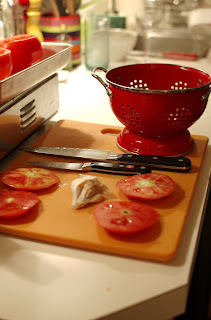 Make sure that the remaining tomato pulp is diced. 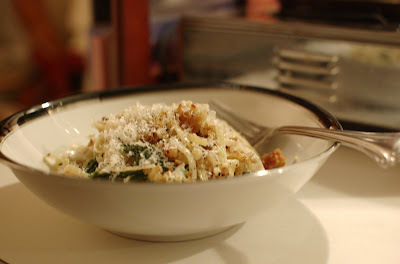 Mix in the chopped mushrooms, garlic, feta, breadcrumbs, and parsley until just combined. Add salt & pepper to taste. 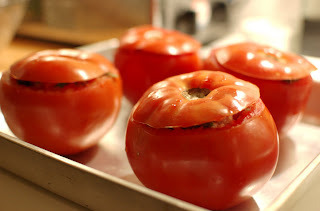 Place the hallowed out tomatoes on a baking sheet and fill with the mixture. Cover with the reserved tops. Place the tomatoes in the oven for 10 minutes. Take off the tomato tops and bake for another 10 to 15. It’s only been two weeks, but I’m already taking a break! Sam and I are finally taking a “summer” vacation so I thought I would leave you with a little something while we’re gone next week. We’re of course going back to Maine 1. Because it’s the greatest place on Earth 2. Because it’s Vacationland and 3. Because I just can’t fathom going through another season without seeing Portland. If you’ve never been to this magical land, I’m going to give you a few tips. They’re essentially all about eating, but that’s what this blog is about so it’s really very fitting. 4. When in doubt, eat lobster. I’m not actually a lobster lover (I know, I know, sacrilege!) but Maine has it’s stereotypes for a reason. Best of all, you can just go to any lobster shack by the water and get a lobster roll and a beer. No need to get all fancy. Have a wonderful week! Many more recipes to come from my hotplate when I get home. Sometimes you just need an amazingly easy, delicious meal to get you through the week. This dish is so easy in fact, that I didn't even have time to take proper photos of the whole process! Sam and I are getting ready to go on vacation next week (more on that to come!) and we are trying to work down what is in our mini-fridge. This is a perfect leftover meal - you can use whatever greens or herbs you have lying around and day or two old bread makes the best breadcrumbs. It took me about 30 minutes in total (including making the breadcrumbs!) and really spiced up the regular old pasta and tomato sauce routine. Let's just say there were no leftovers on this one. Boil pasta in salted pot. 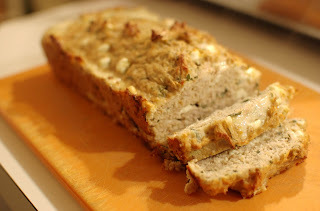 Process bread in a food processor until it’s about the consistency of coarse cornmeal. Heat ¼ c. oil in a frying pan and add the breadcrumbs. Once the breadcrumbs are slightly toasted and golden brown, add the garlic and continue to stir until well toasted. Add the kale to the frying pan with a little bit of the pasta water and sauté quickly.